How do you normally schedule meetings with clients and business partners? By exchanging emails? By calling their secretaries? Every day, we use many tools to increase our productivity, plan tasks, automate work, and analyze our data. It’s all about optimizing as many parts of our workflow as possible, getting more done in a shorter period of time. But when scheduling meetings with potential clients, partners, and the team, we still use email as a primary communication channel. We bet you also belong to the email-club. Every day, millions of people bounce emails back and forth to find a suitable time for meeting another person. A recent study revealed that an average white-collar worker spends about 6 hours a day on email. So how about halting the time wasted in our inboxes? READ MORE: 5 Scientific Studies That Will Change Your Productivity Habits Forever. We bet many of you haven’t heard of these amazing scheduling software that find mutually suitable meeting time without a ten-emails conversation. The best scheduling tools do all the work for us, forwarding meeting proposals to all participants, helping to find a suitable time and place. Methods vary depending on the tool, but saving time is guaranteed when using each of them. Some scheduling tools are integrated with popular calendar apps, meaning that you can add the event to your calendar in a few clicks. If this sounded like something you’d like to try, take a look at these next-generation scheduling tools and decide for yourself which one of these will save you the most time. Calendar invites are only one of Scoro’s large set of features. The benefit of using Scoro for scheduling a meeting is the possibility to link your meetings with customer profiles or projects. Meaning that you can save your meeting data and see the reports on your time spent later on. You can send calendar invites to other participants by creating a meeting event with multiple dates and automatically forward the invitation by email. The receiver can choose the suitable time without leaving their inbox. As a time available for everyone is found, all the participants get a confirmation email and the event automatically appears in their calendar apps. Scoro’s calendar tool is not currently available as an individual product but all the customers who have tried it, keep using it over and over again. READ MORE: If you’re managing your meeting history on a spreadsheet, you should read why you need an Excel Alternative. Give prospects an easy way to book meetings without the back and forth. Your calendar stays full, and you stay productive. Meetings syncs with your Google or Office 365 calendar, so prospects can always see your most up-to-date availability. When you let prospects automatically book meetings on your calendar, you’ll save hours of time spent on unnecessary emails. No designated sales rep? Set up a round-robin meeting link so prospects can book a meeting with the sales rep whose availability works best for their schedule. 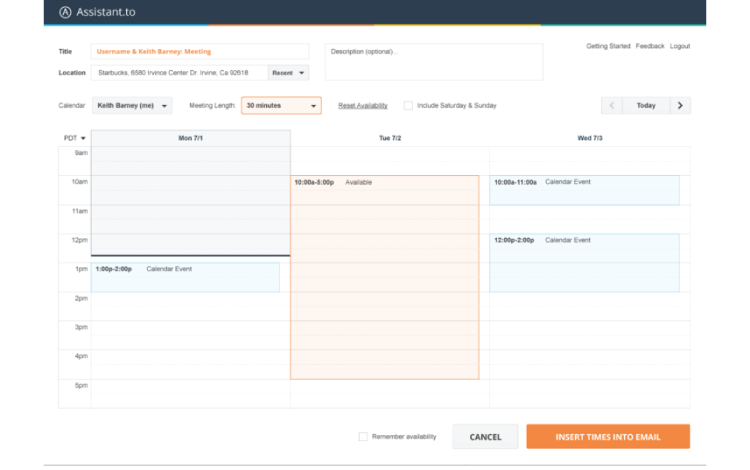 HubSpot Meetings is a free Hubspot product that can be connected to HubSpot CRM. The coolest thing about Rally is the fact that it’s open source. Meaning that many great ideas have been applied thanks to meaningful collaboration. With Rally, you create an event page and share it with other participants. On the page, everyone can pick the most suitable time options. This scheduling tool has a really nice feature – you can write down the meeting notes on the event page to file an agenda and later remember everything discussed. If you like what you’ve read this far, check out Rally here. Doodle’s free basic account is a great way to manage a small team’s meetings. Create polls and email the link to your teammates so that everyone can pick the options that suit them. Later, you can decide on the meeting time by checking which proposed time was selected by the most people. This scheduling tool also comes with a Premium package, offering automatic reminders and integration with a calendar app. Interested? You can find out more about Doodle here. 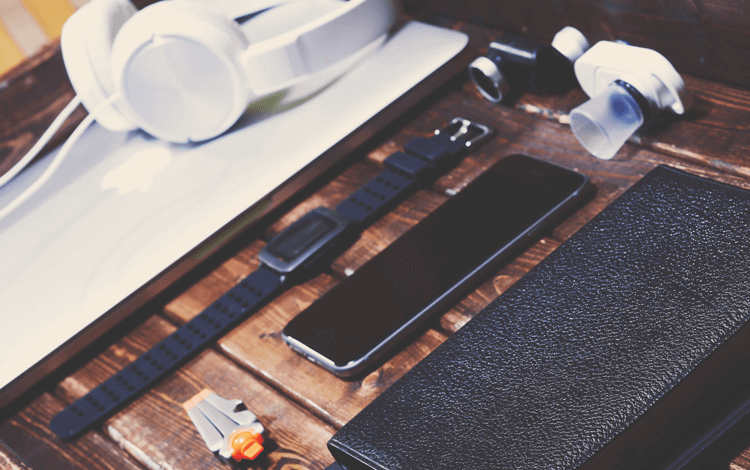 READ MORE: 12 cool (and free) browser extensions for increased productivity. 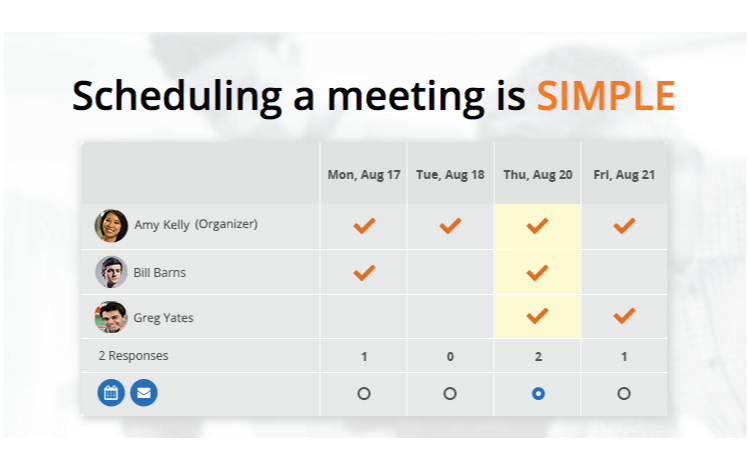 When scheduling a meeting with NeedToMeet, you first need to fill in a form with all the meeting details, including the duration, place and optional dates you’d like to propose. Next, you can either email the link to the event’s NeetToMeet page to all participants or automatically forward the invite via the too so that the time can be chosen without leaving the inbox. After everyone’s picked their available times, you can see the results in a table and find the most suitable time. NeedToMeet is a free tool, you only need the Premium account for priority support and calendar integrations. Get it here. What makes Assistant.to interesting is the fact that it’s not a standalone online tool but an extension for inbox. If you previously composed emails with optional meeting times and forwarded them to other participants, you might want to try this scheduling extension. After other parties have selected the suitable time, Assistant.to automatically schedules the meeting and send invites. If you like to keep all the interaction in email, this could be your go-to tool. There are some shortcomings though. The extension doesn’t support scheduling with over 2 people and has no integrations with calendar apps. So that you have to manually enter the scheduled meeting time to your calendar. If you’d like to give Assistant.to a try, click here. The basic features offered in Timebridge resemble some of the previous tools – you pick multiple dates and send invitations by email. After others have confirmed a date, you both receive notifications. It synchronizes with Outlook and Gmail calendar, meaning that you can select optional time slots while seeing your other scheduled events. A nice little feature in Timebridge is the option to answer Yes/No/Best. This is handy when trying to schedule a meeting with a large team, allowing everyone to select multiple times when they’re available. Calendly is a widely popular scheduling tool among project teams and people who frequently attend business meetings, organize tours or schedule webinars. This easy-to-use and well-designed tool enables sending a calendar invite to everyone you want to schedule with. The invitees receive an email with optional meeting times proposed by the sender. Next, they can pick the time that suits them. Or when scheduling with a large team, you can forward to others an invite to visit your Calendly page and choose all their available meeting times, ensuring that you find the time suitable for everyone. Whenever you’ve agreed on a meeting time, you can add it to your favourite calendar platform in one click. To make the process even smoother, there’s no need for the invitees to sign up for Calendly in order to choose between available meeting times. 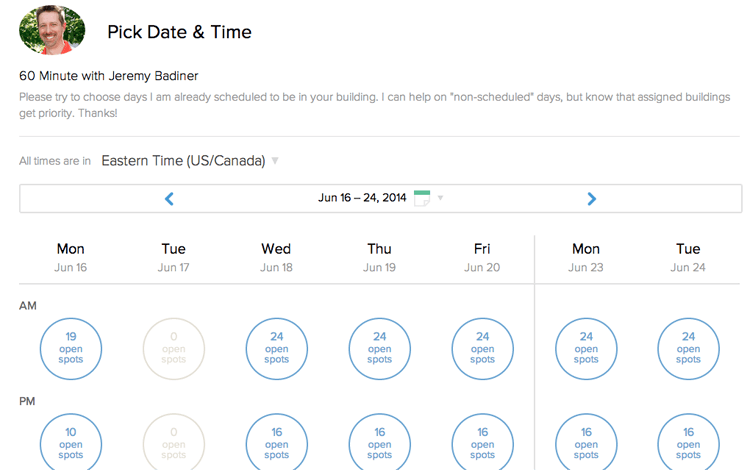 If this sounded like a perfect scheduling tool, you can get Calendly here. Need to convince your team to use the new tool? Learn how to make new software implementation effortless and quick. 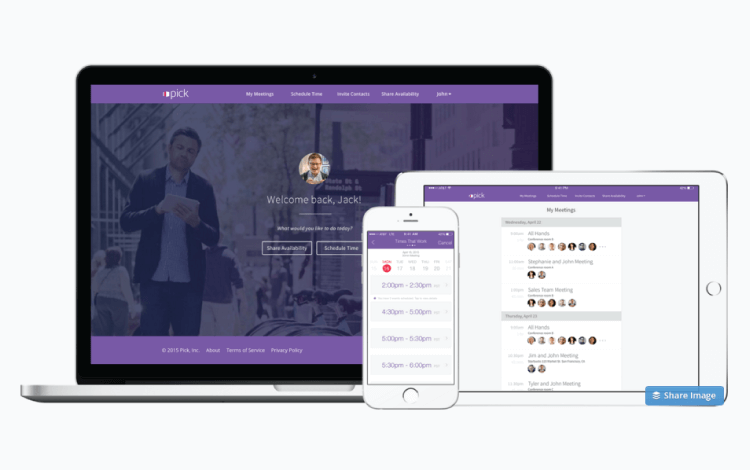 Pick is both a desktop and mobile scheduling tool that helps to determine time periods when everyone is available. It synchronizes with all popular calendar apps and compares everyone’s calendars, proposing optional meeting times. After you’ve found a time that suits everyone and scheduled the meeting, Pick notifies all participants and automatically schedules the event to everybody’s calendar apps. A cool feature in Pick is sharing your available times with others so that they know in advance when it’s the best time for you. Sounds pretty cool, right? Check it out (and get it for free) here. Working in sales? How about some business hacks to communicate more efficiently. Clara is basically your virtual assistant when it comes to scheduling meetings. Backed by human support, Clara can understand your questions and helping to conduct your email conversation with other participants, it finds the suitable time for you all. For example, type in “Clara, can you find a time for us to meet for lunch next week?” and the virtual assistant sends emails to your invitees and determines a time, date, location and participants. Compared to other scheduling tools, Clara may seem relatively expensive. But if you think about the human involvement, it’s what you’d expect. Sounds interesting? 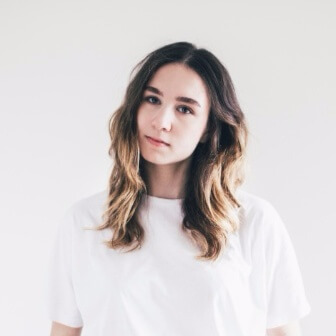 Learn more about Clara here. If after reading this article, you still feel like email is the best tool for scheduling a meeting, we respect your decision. But if you’re into innovation and would like to bring productivity to your workflow, integrate a meeting scheduling to your workflow. Your team members will be forever grateful!